While still important and non-negotiable, reptile keeping is much less fundamental than it was a few years ago. If I’d known about the Shawville by-law when it first came out in 2005, I’d have put up a much bigger fight. While the town councillors assured us we wouldn’t have much to worry about unless someone filed a complaint, my policy in terms of reptile-keeping has always been to be completely above-board. I want to be able to withstand a raid by animal control or wildlife officers. We acquired certain animals (the boa constrictor, the python) for the purpose of doing educational shows. It’s since become abundantly clear that there is no way we have the time to do those shows. We acquired other animals for breeding. Years later, we have the male hognose dead, the two red milks turning out to be both female, and the Great Basin gophers not having produced an egg in five years. We haven’t had anything hatch successfully in three years. Breeding’s not as important as it used to be. The experience of other keepers suggested that the fewer animals we kept, the more we’d be able to enjoy them. Enough cages were removed, once snakes were moved around, that one of the two shelves could be dismantled. This gave us just enough room to put in a bookshelf (for all our reptile books) and — more importantly — Jennifer’s desk. 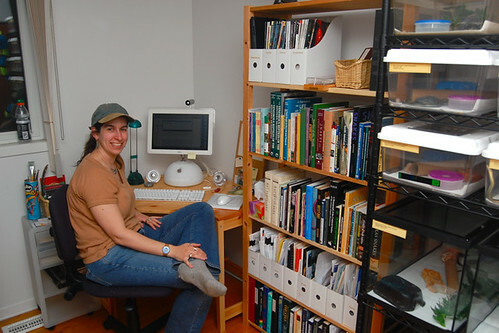 This means that, for the first time, she has a dedicated workspace; she’d previously had a corner of the master bedroom, which was frequently problematic, especially when she had online tutoring in the evenings (when I was frequently dead tired). We also found enough room for her papers and her art supplies; it’s now her office, and the snake room only secondarily.